Sri Lanka lost Lahiru Thirimanne, caught behind off Dale Steyn for nought, but Karunaratne batted confidently to be 28 not out at the close, while new cap Oshada Fernando went on the attack when South African captain Faf du Plessis turned to spin bowling as the light faded to finish on 17 not out. Kasun Rajitha took three for 68. 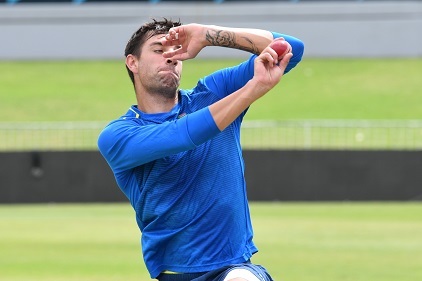 Sri Lanka had reached 49 for one in reply at stumps, but the pitch should still be assisting the bowlers in overcast and humid Durban on the second day, so De Kock is confident the Proteas can still grab a first-innings lead. South Africa captain Faf du Plessis admitted that he was "in two minds" about what he would have done at the toss, but the hosts opted to play an extra bowler and drop Theunis de Bruyn from the middle order. Sri Lanka successfully reviewed a not-out decision by umpire Richard Kettleborough. Spinning all-rounder Milinda Siriwardana is also a potential option, although he last played a Test match for Sri Lanka in 2016 - against England at Chester-le-Street.